MARON: Now, coming full circle, do you know – are you familiar with Timothy Carey? MARON (laughing): I knew it! I knew it! GLOVER: Yeah, I went to his house in the ’80s, late ’80s. MARON: Like, is he a role model? GLOVER: Well, there were two actors when I was studying acting – I could always detect, I could always figure out what the method, for lack of a better word, was that an actor was employing to get to their state. But there were two actors that I did not feel that way about. One of them was Andy Kaufman, and the other was Timothy Carey. And I never met Andy Kaufman, but I had the opportunity to go to Timothy Carey’s house, and it was a very, it was a really – it was really fascinating. I’m very glad I had that experience. GLOVER: Did you know him? GLOVER: Well, have you ever seen The World’s Greatest Sinner? MARON: Right, right. No, I know about the movie but I’ve not seen it. MARON: That’s the one that Zappa did the soundtrack for, correct? GLOVER: Yes, I believe that’s right, yeah. MARON: What was your experience with Timothy Carey? GLOVER: Well, it was fascinating. MARON: Yeah. You were going there to figure him out, in a way. MARON: How did that happen? How did you get the opportunity to go there? MARON: I know Adam Parfrey, I’ve interviewed him. GLOVER: Yeah, he’s a great publisher. He’s in my first film, he’s in What Is It? MARON: His father was a character actor as well. MARON: So he set you up with Timothy? GLOVER: Well, there was a friend of his, or somebody he was acquainted with, that had been in contact with Timothy Carey, and so that was set up so that the three of us went to Timothy Carey’s house. We were there for a number of hours. MARON: And what did you glean? MARON: Uh huh. For an hour. GLOVER: Yes. (laughs) And at first of course it was kind of funny, the first 15 or (laughs) 20 minutes it was funny. And then, and then – (MARON laughs) – it was very serious. He wasn’t doing it as a joke. And then it wasn’t really so funny (he and MARON continue to laugh throughout). And then it was kind of funny again. We were there for several hours. MARON: Well, you watched the film, right? GLOVER: And The Killing. I think I saw The Killing a little later. GLOVER: Paths of Glory I saw later. But I noticed when I was watching the films [Ed. note: The other film must have been One-Eyed Jacks]– you know, James Dean is one of those actors that you’re studying as a young actor, and Marlon Brando – but in those scenes, Timothy Carey has fight scenes with both of them in bars. But in those scenes, my eye was not on James Dean, my eye was not on Marlon Brando, it was on Timothy Carey. But the part that I hesitate to say a little bit but maybe I’ll say it – at one point – you hear a lot of different tales, I don’t know if you’ve heard a lot of tales about Timothy Carey, but I’ve heard a lot of tales about him that are fascinating. Like he disappeared during the shooting of Paths of Glory in Germany. If you look at the film, his character is in shadows at a certain point in the prison. But he wasn’t originally supposed to be in the shadows. He disappeared during the middle of production. I’ve heard different tales as to how he was found, but essentially they just had to hide his character and then they put him back in once he showed back up again. Also I think he met his wife in Germany there, and Kubrick did as well. So there’s something in common. But he kind of pointed at his head at one point and said – I almost feel like I’m betraying something private. He said something about his mental health. So it was fascinating to me because I realized that part of what was hard for me to detect about him was there was something going on, I gleaned or assumed from talking to him, that was essentially undetectable because he was having, for lack of a better word, mental health issues. And so that’s part of why I would say probably it was hard for me to detect what his specific method was. Like Marlon Brando, he’s a great actor but I can essentially understand what he’s employing to get to the state, or James Dean. But like I said, I never met Andy Kaufman so I don’t know exactly where it was coming from. And Timothy Carey, even having had that meeting of course, I don’t know the exact neurons, so to speak, for getting to that point. MARON: Well, you’re sort of one of those guys too. GLOVER: Well, I probably early on have always been interested in the idea of art and madness, for the lack of a better word, as being good for art. 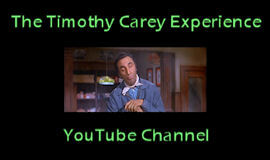 Timothy Carey, the name has a certain aura to it. Some cinephiles know this feeling, those who go out on a limb and watch what little role he has. Carey, a character actor who zigzagged through the latter half of American cinema’s history, from A to Z pictures and everything in between, had a special talent. He could make a thin role into something memorable. He threw his 6’ 4’’ body around and spoke with a voice that sounded more like a cement mixer. He stole scenes, evaporating the memory of those that came before and after it. Only Stanley Kubrick and John Cassavetes managed to integrate Carey into their films seamlessly. For both filmmakers, he appeared twice in their work. For Kubrick: The Killing (1956) and Paths of Glory (1957). For Cassavetes: Minnie and Moskowitz (1971) and The Killing of a Chinese Bookie (1976). They were able to rein in Carey, controlling his high-strung acting for maximum effect. In Paths of Glory, in fact, Carey gives a career-performance. An interlude from the psychotics he often played, as Private Ferol, Carey is a smooth man, someone who would fit in with Jack Kerouac and co., not WWI France. By film’s end, he becomes unraveled. Along with Ralph Meeker and Joe Turkel, he’s one of the soldiers court-martialed and executed. “I don’t want to die,” he repeats, sniveling, whimpering, and crying as he faces the firing squad. For every friend, Carey had three or four enemies, people who couldn’t tolerate his brand of free-wheeling, combusting improvisation. Fact and legend often blur in Hollywood history. In Carey’s case, there seems to be more legend than fact. His bouts with actors and directors are tabloid-worthy and tailor-made to his outsider persona. Billy Wilder and James B. Harris fired him. Elia Kazan dubbed his guttural lines. Richard Widmark and Karl Malden beat him. Marlon Brando stabbed him with a pen. Always cheeky, Carey proclaimed that he was fired more than any other actor in Hollywood. Timothy Who? Timothy Agoglia Carey, sometimes Tim Carey, most of the time Timothy Carey. 1929-94. This character actor (dis)graced American screens for five decades, playing vile, despicable and loathsome scum of the earth, void of any redeeming quality. What has he been in? You might be familiar with The Wild One (1953), East of Eden (1955), The Killing (1956), Paths of Glory (1957), One-Eyed Jacks (1961), Minnie and Moskowitz (1971) and The Killing of a Chinese Bookie (1976) to mention a few out of 50 something screen appearances – not counting television, which credits for about 50 more. Despite this sizable curriculum, he was quite possibly fired more often than any other actor in Hollywood, for example by Billy Wilder and Arthur Penn, and also quite willfully turned down parts in movies such as the first two Godfather films as well as Kubrick‘s Spartacus. If so vile etc – why is he worth watching? This 193 cm/6′ 4″ male specimen sported a pair of heavy-lidded eyes that matched Robert Mitchum’s, a set of clenched teeth that beat out Burt Lancaster’s, a dance routine that would have frightened James Brown and tantrums that outdid Harvey Keitel’s. This is partly why. The World’s Greatest Sinner? A film he wrote, directed, produced and starred in, shot between 1958 and 1961, and released in 1963. He plays Clarence Hilliard, an insurance salesman who quits his job, changes his name from Clarence to God (he keeps Hilliard) and starts his own political/religious movement, promising to turn everyone into “millionaires, gods, super human beings!” He dons a silver lamé suit [NB: It was actually gold] and becomes a (very unlikely) rock ‘n’ roll idol, then runs for president of the United States as the candidate of The Eternal Man Party. The film is narrated by a snake and was promoted as “The most condemned and praised American movie of its Time”, but soon disappeared from the public eye. Among the few people who saw it were Frank Zappa, who wrote the film’s songs and called it the world’s worst film, and John Cassavetes, who said it had the emotional brilliance of Eisenstein. Among the people who didn’t see it was an indifferent Ingmar Bergman, despite the fact that Carey sent a friend to Sweden with a print earmarked for the director’s viewing pleasure, as well as a most enthusiastic Elvis Presley, on whom Carey did not want to waste a precious print, as he only had four left. Carey and Vienna? Some almost five decades late, in November 1st, 2009, The World’s Greatest Sinner finally had its Austrian premiere. A packed audience at the legendary Gartenbaukino cinema in Vienna savoured the treat with awe. A tribute section devoted to selected Carey gems included Head (featuring pop group The Monkees and written by Jack Nicholson), Minnie and Moskowitz, Paths of Glory, Poor White Trash (a sordid exploitation story in which scary Carey is again seen doing a crazy dance), and another Carey directorial effort, Tweet’s Ladies of Pasadena, in which he plays a kind (!) member of a ladies knitting club who constantly roller-skates and wants to clothe naked animals. Along for the ride was Romeo Carey, one of four [NB: Actually six] of the actor’s children, providing insightful information on his father’s career (as well as being living proof of the fact that Carey, apart from being vile, despicable and loathsome, also was a family man) and guiding us through a highly unusual career (which also include a one-man stage performance on the topic of flatulence). So is he just a cult guy? True, if Carey is in a film, even if it’s Francis the Talking Mule in the Haunted House, it’s worth seeing. Even in the smallest of parts, he manages to steal from the greatest of greats – some of them feeling surprisingly outdated these days, whereas Carey himself remains utterly watchable. In this respect, he comes across as a forerunner of sorts to actors like Vincent Gallo, Harvey Keitel and even Michael Richards, whose Kramer character in Seinfeld arguably owes a moment or two to Carey. In other words, this is an actor with a resonating presence. The idea of giving Carey a well-deserved tribute is thus highly appropriate, as well as being film festival retrospective programming at its finest. Why has no one come up with this idea before? That’s The Big Timothy Carey Question. Quite simply. This week’s quote is from an independently published memoir by and about Robert Austin Brady, acting coach and former member of the American Mime Theater. He was briefly employed as assistant and driver to Stanley Kubrick, just before Kubrick started shooting 2001: A Space Odyssey (1968). Apparently while driving Kubrick around, Brady got a chance to chat with him quite a bit about his films. While discussing Paths of Glory (1957), this choice interchange occurred. It is a remarkable, and let’s face it, rather disappointing read, for Kubrick throws major shade at Timothy, and also at Karl Malden. BOB: Absolutely. I think that was Kirk Douglas‘s best performance, and George Macready, who can also play heavy-handed, was terrific. 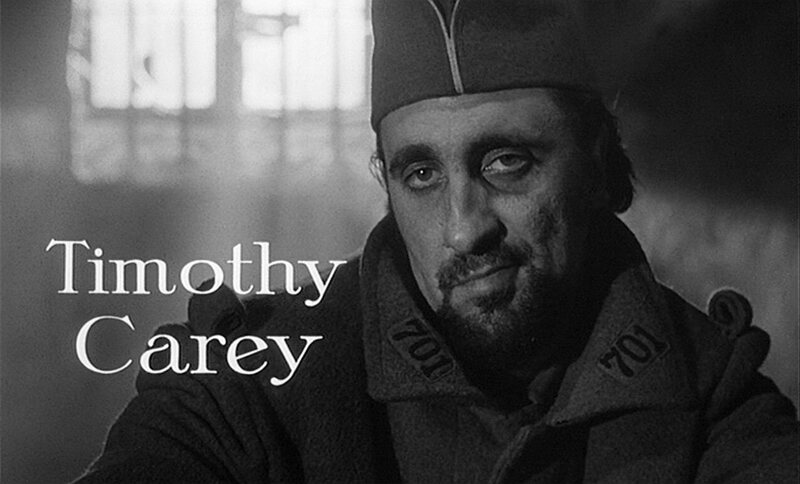 And Timothy Carey, in several scenes, was riveting–unforgettable. You cast him earlier, in “The Killing“. SK: Never again. He was wild–almost dangerous to have around. He was almost impossible to direct. He never matched his movements to his lines. He accidentally hit Ralph Meeker so hard in the face that we had to stop shooting for the day. He was brilliant, but impossible. As a matter of fact, my next film was going to be “One Eyed Jacks” with Marlon Brando as star/producer. I brought in Calder Willingham to adapt the script. Calder and I adapted “Paths of Glory“. I worked on the script for two months but then I decided to drop the project. My main reason was that Brando fired Calder, and my enthusiasm faded. The other factor was casting. Marlon had promised Karl Malden and Timothy Carey, the co-starring parts. I knew Karl Malden was not a worthy adversary for Marlon. He lacks charm and empathy. I don’t think he’s a good actor. I wanted Paul Newman for the part, or somebody like that, somebody the audience could feel some sympathy for and I certainly didn’t want to work with Timothy Carey again. So, Brando wound up directing. Our video for “Timothy In Color Week” is the full-length feature film directed by (his only effort) and starring Marlon Brando, One-Eyed Jacks (1961). Tim absconds with his scenes as Howard Tetley, town drunk, bully and lech. Several of Tim’s scenes, such as the one where he fights Karl Malden, were unfortunately cut from the final film. But his famous brawl with Brando remains intact. Enjoy! Modern hipsters didn’t invent the cult actor. Oh, we might all feel really cool raving about icons like Christopher Walken or newcomers like Michael Shannon. There’s still a long history of weirdo artists infiltrating our movie theaters and living rooms. Just consider the epic strangeness of Timothy Carey. He maintained a perfectly normal career as a character actor right through the 1980s. In fact, Carey would’ve managed one more great role if he’d passed Quentin Tarantino’s audition to play the crime boss in 1992’s Reservoir Dogs. Tarantino cast veteran oddball actor Lawrence Tierney instead. The director dedicated Reservoir Dogs to a list of idols that included Carey, though. That was nice–especially since Carey would pass away in 1994. But why would Tarantino dedicate his first feature to a guy who’d shown up in mainstream TV shows like Starsky & Hutch, Charlie’s Angels, and CHiPs? That’s because Carey was far more than a character actor. He was a beatnik visionary and a true wild man. The young actor first made a name for himself by stealing a scene from Marlon Brando in the pioneering biker epic The Wild One. Carey didn’t even get billing, but the hulking actor with the basso voice was soon being used as a heavy by all kinds of directors. He gave one of his most compelling performances as a crazed Cajun in 1957’s Bayou, where he contributed to a sleazy atmosphere that kept the movie playing the drive-in circuit well into the ’70s. Stanley Kubrick cast Carey in memorable roles for both The Killing and Paths of Glory, and a lot of other directors–including John Cassavetes–loved Carey’s knack for crazed improvisation. That was the kind of Hollywood connection that got Carey playing parts in three episodes of Columbo. Other directors, however, couldn’t tolerate Carey’s maniacal Method acting. Carey did a lot to sabotage his own career, too. He turned down roles in The Godfather and The Godfather Part II–and walked off the set of Francis Ford Coppola’s The Conversation. That’s three less classics in Carey’s weird filmography, but he found time to appear in Chesty Anderson, U.S. Navy and the Joe Don Baker epic Speedtrap. To be fair, Chesty Anderson gave Carey the freedom to let loose with one of his more amazing performances. Carey also wrote and directed himself to an amazing role in 1962’s The World’s Greatest Sinner–which was pretty much forgotten for most of Carey’s career. Originally, the film’s legend was kept alive by some musical contributions from Frank Zappa. Then Sinner began to build a bigger reputation as Carey’s own careening genius built his own cult. It’s an amazing film, and was recently restored and is now available to the masses. There’s no other movie like it. The first day I visited Universal Pictures in 1978, I met a legendary actor at the studio commissary. Timothy Carey. I went up to talk with him. He didn’t look as he did in the movies, but I sure recognized him. Whatever quality he had on the screen floated around him like a wraith. You know what I mean. He was the crazed horse sniper in The Killing, delivering lines through his teeth like an insane Kirk Douglas parody, working out the details of his grisly shooting job, all the while lovingly scratching a puppy. Later, as they march helplessly to the firing squad, Carey improvises his own forlorn dialogue, to tremendously moving effect. He was one of only a few actors Kubrick would allow to do that. I talked to Tim Carey quite a while. He was very friendly and didn’t mind. He really made my day. We talked about movie acting and Stanley Kubrick and Marlon Brando and Frank Zappa and Jack Nicholson and the indie feature movies Tim made with his own money. Then we had to go. It was time for my appointment. He was at Universal to do some other business. He raised and trained attack dogs now, and gave me his business card for his dog-training company “K-9 Attack Dogs.” It was in my wallet for a long time, and then on my bulletin board, (next to Stanley Kubrick’s phone number). I called Mr. Carey a couple of times; he was always nice, even though I wasn’t in the dog market. I’m so glad I met him; he was an original. What a character in real life, and when the cameras started rolling, always completely perfect for the screen. Every movie he was in, he stole the frame, no matter who else was in it. Kirk Douglas, Marlon Brando, anybody. What a career. And talk about chutzpah – he once climbed over the Fox studio wall – in a suit of armor – to get an audition for Prince Valiant. Can’t beat that. Lots of people have been influenced by him. I know I have. Quentin Tarantino‘s script for Reservoir Dogs is dedicated to a list of influences. Timothy Carey heads that list. Timothy Carey, I salute you. THE WORLD'S GREATEST SINNER at iTunes! Timothy Carey – What a Character! Blood Among the Stars: The Making of "Carrie"
Paul D. Brazill's You Would Say That, Wouldn't You? The Blog is Coming From Inside the House! You Know the Face, But What's the Name?